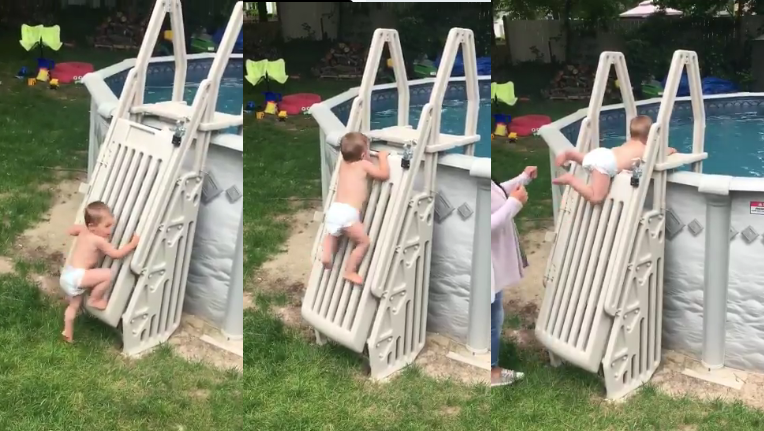 Mr. Keith Wyman’s video of his own two-year-old climbing the pool security ladder which he had bought to ensure the safety of his children shows two things: firstly, the manufacturer should have tested this better and secondly, that kid has some serious upper body strength. As the family was sitting in their backyard in Attleboro this Monday, 2-year-old toddler Cody all of a sudden started taking an interest in the gate blocking the ladder to their above-ground pool. Mr. Wyman luckily filmed his child as he didn’t believe that he would be able to do it, but lo and behold, after just 30 seconds young Cody had managed to get upstairs. Luckily for him, his parents were around. The Wyman family claims that the store where they bought the ladder and gate to secure their pool offered them a replacement after they showed the video, but all the other gates had a similar design. It would thus appear there is an opportunity for US manufacturers to come up with a better design, as well as a warning for existing pool owners to make sure kids cannot crawl upon these ladders. The video has by now been viewed more than 16 million times, showing the importance of the topic. dumb design…. but this kid is not average. Agreed kid not your average baby … a 2 year old in diapers? Plus able to lift own weight in an invert position.